My GoodKnit Kisses garden is in full bloom this spring! 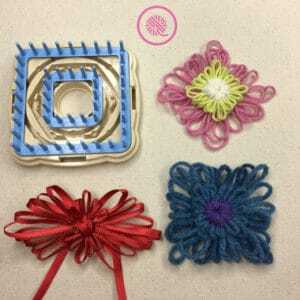 I’ve been getting creative with my Clover Hana-Ami Flower Loom (aff. link) and my yarn stash. 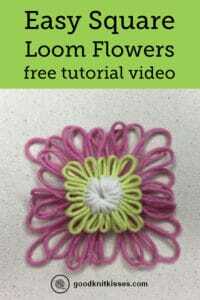 I’ve got a collection of 4 video tutorials for you this week all featuring beautiful flower loom blossoms. With a few twists of yarn and some simple darning techniques your garden will be in full bloom too. (No watering required!) 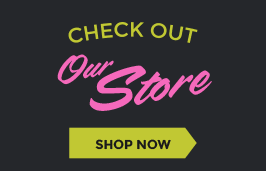 Be sure to scroll all the way to the bottom to see each flower, the supply list and video. 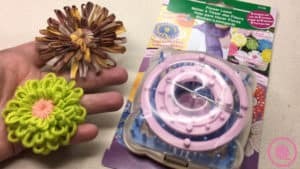 The possibilities for your own flower loom garden are endless. You can set up the flower in a variety of ways and using yarn, raffia and even ribbon can create stunning flowers and bows. Flower loom embellishments add a special touch to hats, scarves, blankets, headbands and hair bows. You can even use them for beautiful, uniquely wrapped gifts. 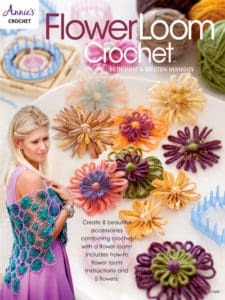 Better yet, crochet them together and wrap yourself in beautiful flowers all summer long. You will want to check out my post from last week about different techniques for stitching the centers of the flowers. These essential skills will make creating the flowers much easier. 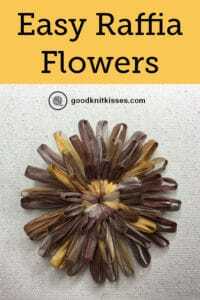 Plus when you combine the various methods for the flower centers with different flower shapes you can create a unique flower every time you pick up your flower loom. 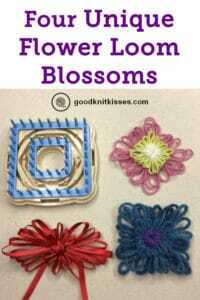 You can see some great ways to use these flower loom blossoms in my book Flower Loom Crochet (aff. 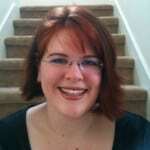 link). Create a flower that’s outside the box with this colorful 3-color square flower. Sometimes you want the fullness of a pompom, but something that can lay flat. This three layer flower mimics the puff of a chrysanthemum and makes a perfect embellishment with a little more dimension. Loom Setup: Large and small round pieces and medium hexgonal loom piece.